For Parties 12-15 children. Additional children fee applies for 16 or more. JUST Face Painting Party... Birthday child may choose his/her own special full face design AND a glitter tattoo. Guests may choose a face painting design. Story board choices are available and theme designs too. We offer 2 packages. Up to 15 full face design. Or Up to 20 full face designs. 20+ children additional fees apply. 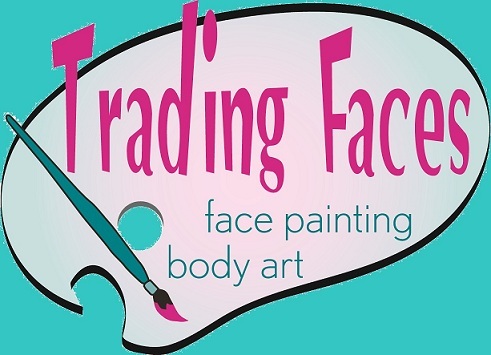 Trading Faces to come to your destination for your party/event needs. Now offering spin-art for any event or party. Package Prices are for Birthday Parties Only. Please contact Monica if for other venues such as fundraisers, company picnics, grand openings, special events, road races, non-profit events. NEW... UV Black Light Face Body Art Painting Party. This is for parties of 12-15 children. Additional children fee apply for 16 children or more. This is great for ALL ages. All we need from you is a room that can be made dark and outlets. We do the rest. UV paints and glitter with Black lights make an AWESOME unique party!!!! Waterproof Glitter Tattoo Party. Perfect for pool parties, on the lake, water play birthday parties. Each child may choose a waterproof glitter tattoo. We have over 50 tattoos to choose from) Glitter Tattoos last 3-7 days depending on how it's cared for after.